On Thursday October 27, join me and my friends at Argyle Social for a valuable (yet free) Webinar that puts some of the big questions about social media timing under the experimental microscope. We’ll cover a lot of ground about when’s the best time for Twitter and Facebook communication in different scenarios. We’ll dispel some myths, and probably create a few new ones. 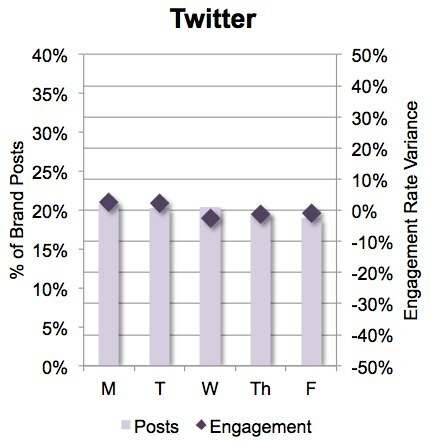 One of my favorite findings from the research (which analyzed more than 250,000 social media messages sent via the Argyle Social platform in 2011), is that despite what you may have heard, for B2B companies it really doesn’t matter what day you send your tweets. Our analysis finds no statistical basis for tweeting more on any particular weekday, with only very slight increases in engagement on Monday and Tuesday (and those increases are correlated with increases in volume of tweets sent on those days). Sometimes, like in this case, despite how hard we look for it the answer we seek just isn’t there. I find this piece of B2B “non-advice” interesting, because dating back to the early days of email marketing, we’ve always wanted to believe that message recipients’ behavior differs enough through the week that we should stage our communication accordingly. We used to send emails on Tuesday, Wednesday, Thursday because more people are on vacation Monday and Friday. Then, everyone starting sending their emails mid-week, and we flooded inboxes so much, engagement rate plummeted. This particular dataset (B2B, Twitter, Weekday) found no discernible pattern that you can act upon, but that’s not at all true for our entire study. We’ve got some very interesting findings about B2C, Facebook, Weekends and more, that will get you rethinking how and when you communicate in social media. For those, you’ll need to tune in on Thursday. We’ll also teach you how to run legitimate testing experiments on your own data, in your own company. I hope to see you logged in at 1pm eastern.